Going to have to give this one a go soon. Brilliant as always Alex. Built it up with an AC128/176 pair and 5088's and it works like a charm. Haven't had a chance for a proper play with it yet but you can tag it verified if you don't mind the transistor subs. 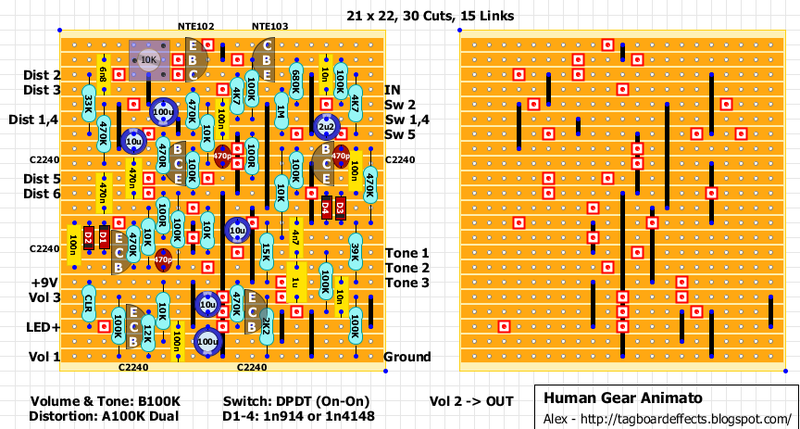 Watch the pinouts if you use 2N5088s! Only had 2 minutes testing on guitar, so far sounds like your average muff. Eager to try it blended on bass though. It looks like you can get the NTE102 and 103 from Allied Electronics, but they are expensive. I had no better success finding the AC128 substitution suggested above. Those are quite scarce ad even more here in europe. One could go with any germanium NPN/PNP pair. AC128/AC127 should be a nice sub.... Perhaps a low gain Si could do the trick too. Something like 2N2369 paired with 2N2907. That won't sound like the original (or AC128/AC127 subs), but it'll work. As it has forward current transfer ratio (hFE gain) of 200-700, the suitable subs would be 2N2222(A), 2N3904, 2N5088, BC239, BC550 etc. Basically any NPN Si. Voltage ratings do not matter much here as the circuit is run with 9 volts. Sockets and experiment what sounds the best for you? 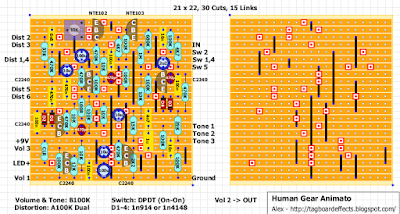 Regarding the transistors, I tried a few germanium combinations for the input pair and AC128/AC176 were the best by far. They're plentiful on eBay thanks to the fuzz factory and the like (though avoid "aberdeencd", totally useless). I tried low gain silicons and they were just awful, really dull and farty. The 128/176 pair gives a really grindy, sharp attack on bass which is just lovely. As for the 2240s - I can't believe I'm about to type this, but I noticed a marked improvement in tone over the 5088s I had in before. Normally I'm a steadfast member of the "all equivalent spec transistors are created equal" anti-mojo crowd, but it just seemed livelier with the 2240s. I did get a really good batch that all had pretty much the same hfe, which may be the reason, but they're not massively pricy (I think I got 10 for £5), so I'd recommend giving them a try. Built this using an AC128/AC176 pair and I can confirm it sounds really great on bass! Blending with the original signal is definitely a must. Can anyone who built this confirm? Thank you so much for this layout! I love it too on bass (with the added blend). I don't remember what I did with my Tone pot when I've built it. It is supposed to get darker CCW. The NTE102 collector connects to the NTE103 emitter to form what is called a Sziklai pair. Which blend do you guys recommend? Thanks! I wonder how to settle the 10K trimm pot. Hey all built this one and having an issue with the volume/gain. The volume is very low and when I reduce the drive below about 3/4 I loose all volume. Since the gain is a blend I'm assuming I'm not getting the clean part of the signal. Also not sure what to do with positions 3,6 on the switch (left them empty), switch doesn't seem to be doing anything, not sure if the two issues are related. I think I may have solved my issue, I was using NTE102A and NTE103, looks like 102A drives less gain. I find that to get mine working even with low volumes I have to change the orientation of 102 like Lucus above, I'm pretty new to this so may be making a/some silly mistakes, any advice would really be appreciated. Had a good build using AC128/AC176, identical problem to Lucas M though, had to flip NTE102 to get it to work. Very confusing... my multimeter agreed that I had the pinouts correct, but I still had to flip NTE102! I'm not good enough with electronics to work out if my multimeter was giving me a reverse pinout, but I did try every pin combination for both of them, getting the highest gain reading in the "correct" pinout. Tried a fair few pin combinations on the board too, all sounded like crap except the NTE 102 reversed, and NTE103 with correct polarity. Most confusing! I built this. It sounds great. Just wondering where I should set the trimpot? Sw 1 & 4 are connected together. Sw 3 & 6 are not connected at all. Thank you very much for such quick response! I already triple-checked all the things written in the "Fault Finding" section: cuts, transistor pins, soldering, bridges, etc. My patience is almost infinite, but I ran out of ideas and as I have only really limited electrical knowledge (being a mechanical engineer..), I would be really thankful for any help, what to do now. I built the circuit with C2240s and an AC128-C2240BL pair (I know it is not perfect, but the schematic-writer guy wrote that it will give decent result with an AC128/2N5088 pair and I could not acquire a 2N5088 -> C2240BL was advised); cheramic caps (I do not know if not-using film caps makes any difference) and I tried to use it with a battery, so unclean source can be (I think) excluded. How would I wire this without the switch? strange question, has any one ever picked up any radio audio on this pedal. when you use trimmers is it important to use the correct value given in the layout? if i used a 5k or 20k, hell even a 100k trimmer, will it affect the resistance elsewhere even if it is adjusted to supply the correct voltage for the transistor? With 100k trimmer, it will be more hard to precisely fine the sweet spot of the transistor. thanks, thats a good point to consider. any thoughts on using a higher value than whats on the layout or will it not matter too much? with Q5 PNP transistor, I mean you can put it in revrse (emmiter and collector. With Q5 in reverse you will have more gain and a lot more mediums (less spurty) good for guitars. Also Q4 and Q5 have to be with not so much gain as it's a Sziklaipair so gain multiply.